Want Linux preinstalled on your PC? 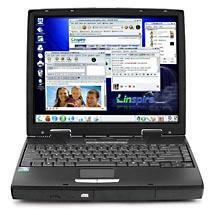 · Linspire Linux is an easy-to-use, full-featured desktop operating system that is totally familiar for Windows users of all experience levels. Linspire comes with everything you need to browse the Internet, instant message, e-mail, share and write documents, work with digital photos, listen to music, play games and much more. · CNR Service subscription lets you 1-click install over 1,900 software titles in categories such as Business, Education, Games, Internet, Design and more. Automatic updates and management included! · All-in-one digital photo manager, featuring tools to import, organize, edit, crop, enhance, and share digital photos. Hundreds of digital cameras supported. Even use your photos as a screensaver and make video CDs! · Complete music management with Lsongs to import, organize, play and burn CDs of your favorite music Networking PCs and Printers: Share files and printers between Linspire OS and Microsoft Windows systems Plug-n-Play peripheral support. From http://www.tigerdirect.com/ there is the Systemax™ Venture L340 Linspire Built-To-Order Desktop PC: from 299. High performance at a good price. It doesn't get any better than this power-packed, feature rich Systemax Venture System. For $299 you get an Intel® Celeron D 2.93GHz CPU, 40GB hard drive and 256MB of fast DDR 333MHz PC2700 RAM. If you need more then prepare to customize this system to your liking. Systemax Build-To-Order offers literally millions of combinations. A larger hard drive, more memory or upgrade the video. They let you choose your operating system, network connection, sound and accessories. Add a cool speaker system. You can even add a monitor if you don’t all ready have one. A Complete Microsoft Office file-compatible office software suite lets you easily create and share written files (.doc), spreadsheets (.xls) and presentations (.ppt). All-in-one digital photo manager, featuring tools to import, organize, edit, crop, enhance, and share digital photos. Hundreds of digital cameras supported. Even use your photos as a screensaver and make video CDs! Complete music management with Lsongs to import, organize, play and burn CDs of your favorite music Networking PCs and Printers: Share files and printers between Linspire OS and Microsoft Windows systems Plug-n-Play peripheral support.